Two antiquities that had been due to be auctioned in New York in June this year have been handed over to Italian officials ("Looted artifacts being returned to Italy from NYC", AP December 2009). 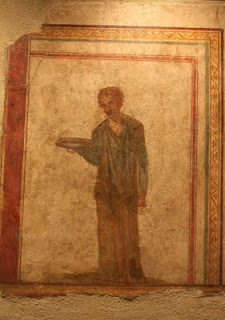 One was a fragment of Roman wall-painting that had been found at Boscoreale (see earlier comments). Five other fragments from the same series have also been recovered from other locations. The other piece is a Corinthian krater that was recovered from Christie's (see earlier comments). It had apparently been handled by Giacomo Medici and sold at Sotheby's in 1985. Other items that apparently passed through Christie's this summer have also been seized (see earlier comments). Why is such material passing through a major auction-house?